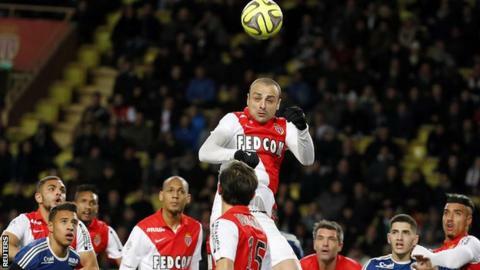 Dimitar Berbatov was unable to add to his tally of 13 goals for Monaco. Lyon were left to rue the loss of injured striker Alexandre Lacazette as they were held to a draw in Monaco. The improving hosts made it eight straight league clean sheets as Lyon's lead at the top of Ligue 1 was cut to just two points. Dimitar Berbatov could have won it for Monaco but his first-half header from Fabinho's cross hit the bar. There was no way through for Lyon despite Nabil Fekir shooting wide from Yoann Gourcuff's pass after the break. Lacazette, who has 24 goals in 24 games this season, is out for three weeks with a thigh injury. Elsewhere Julien Feret's fine solo effort in the first half gave improving Caen a third straight win as they surprised fourth-placed St Etienne. Bordeaux and Guingamp remain in mid-table after a 1-1 draw. Match ends, Monaco 0, Lyon 0. Second Half ends, Monaco 0, Lyon 0. Attempt missed. Yannick Ferreira-Carrasco (Monaco) left footed shot from the centre of the box is high and wide to the right. Assisted by Bernardo Silva. Corner, Monaco. Conceded by Lindsay Rose. Attempt missed. Dimitar Berbatov (Monaco) header from the centre of the box misses to the right. Assisted by Layvin Kurzawa with a cross. Offside, Monaco. João Moutinho tries a through ball, but Dimitar Berbatov is caught offside. Corner, Monaco. Conceded by Maxime Gonalons. Corner, Monaco. Conceded by Anthony Lopes. Corner, Monaco. Conceded by Christophe Jallet. Substitution, Lyon. Maxwell Cornet replaces Yassine Benzia. Mouhamadou Dabo (Lyon) wins a free kick on the left wing. Substitution, Monaco. Anthony Martial replaces Nabil Dirar. Corner, Lyon. Conceded by Ricardo Carvalho. Attempt saved. Fabinho (Monaco) right footed shot from the centre of the box is saved in the bottom right corner. Assisted by Bernardo Silva. Hand ball by Yassine Benzia (Lyon). Attempt missed. Layvin Kurzawa (Monaco) left footed shot from outside the box is high and wide to the left. Assisted by João Moutinho. Attempt missed. Nabil Fekir (Lyon) left footed shot from the centre of the box misses to the right. Assisted by Yoann Gourcuff with a through ball. Foul by Lindsay Rose (Lyon).